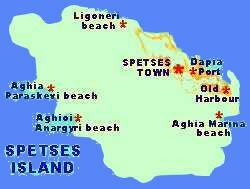 SPETSES or SPETSAI is situated 64 nautical miles from Athens. Spetses is the most enchanting of the Saronic Gulf Islands. The island is only 3 miles wide and 5 miles long. Spetses has one town around two harbour areas, the town of Spetses and the rest of the island is covered by the beautifully scented pine trees and bordered by secluded coves and beaches. You can access the island Armata Boutique Hotel in Spetses by various ways : By flying dolphins hydrofoils to Spetses from Pireaus port. By boat to Spetses from Piraeus every day at 8.00 am. By car, you can drive through the Peloponnese to Kosta few kilometers outside Kranidi Argolidas, leave your car in the outdoor parking and cross over to Spetses island either: By ferry boat from Kosta, which goes to Spetses 5 times a day and it takes just 15 minutes. By small boats from Kosta, which are available 24 hours a day and take 20 minutes. By speedy taxi boats, which are available 24 hours a day and take only 5 minutes. 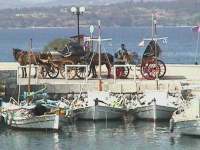 The only means of transportation that can be used on Spetses island are bicycles, motorcycles, taxis, traditional horse cars and sea taxis. The sea taxis can carry you to any place on the island and run twenty four hours a day.